A magical herb used in ancient Asia for a plethora of issues, Mugwort Tea is popular today for its physical and spiritual benefits. Several species of aromatic plants in the genus Artemisia are commonly named mugwort. 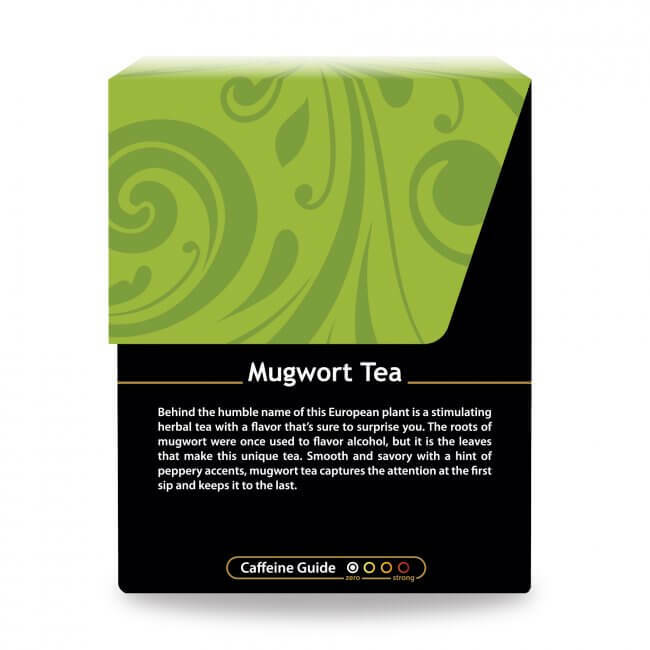 In Chinese, Japanese, and Korean Traditional Medicine, mugworts are readily used for medicinal purposes. It is a prolific perennial plant that grows in both urban and wild areas. Mugwort’s benefits are huge, thus its thousands-of-years-long use. If you believe in magic, mugwort is bound to appeal to your intrigue with the mystical. Way back in the Middle Ages, Europeans used mugwort to protect travelers from evil spirits and wild animals. Today, Mugwort is extremely popular with herbalists. It is an herb profoundly connected to the feminine, dreaming, and life cycles. Practitioners incorporate mugwort into healing oils, and tinctures; they suggest infusing it in baths, and use it for moxibustion* sessions. What Does Mugwort Tea Taste Like? Though the cheerful greenish-gold tone invites you into a seemingly simple, smooth tea-drinking moment, looks here are deceiving. The truth is that this super important herb tastes, well, “bitter.” But here’s the deal: bitter isn’t bad! Trust us. Those familiar with plant medicine are well aware that when the tongue tastes bitter, something powerful is taking place. Once you begin to feel the healing energy that mugwort lends, we believe you’ll begin to crave this ancient, powerful herbal remedy. Nonetheless, there is no doubt that while sipping this meaningful brew, you’ll know you’re doing your body, and mind, a great service. If you enjoy a more bitter tea, use one teabag for 8 ounces boiling water, and let steep a full 3-6 minutes. If bitter isn’t your thing, try this: Drink several milder cups a day. For this route, pour boiling water over one teabag, and let soak for just a single minute. Or, fix a strong batch using 2-3 teabags in 16 ounces of boiling water. Add ice, and drink as an iced tea. Add sweetener of choice if desired. Without enough long-term studies, pregnant and lactating women are advised to avoid mugwort. 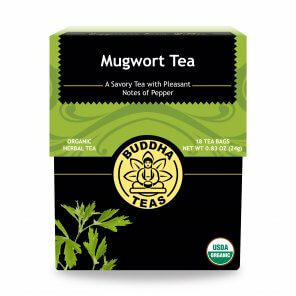 As always, we suggest that if you have any doubts, you check with your health care practitioner prior to consuming Buddha Teas Mugwort Tea. *Moxibustion: a traditional Chinese medicine therapy, which consists of burning dried mugwort on specific points of the body. Where to Buy Mugwort Tea? Unlike common blends of herbal tea, mugwort tea can be a little harder to find in local grocery stores. 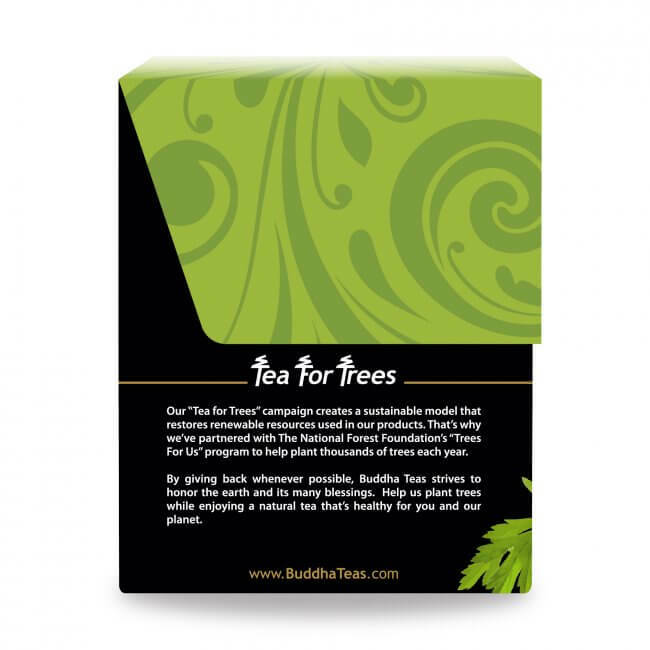 Buddha Teas offers a vast selection of hard-to-find herbal teas like mugwort tea at the best price available. 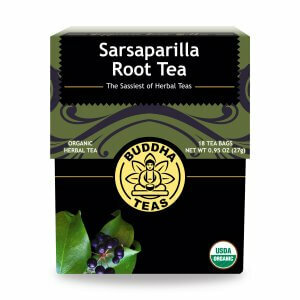 With Buddha Teas you’ll be receiving 100% chemical free, organic herbal teas packaged in bleach-free tea bags. We know saving money is important to you, which is why we offer special bulk prices and even FREE shipping for orders of $50 or more. Buy today and take advantage of our coupon codes to save even more! This tea is an acquired flavor. I feel refreshed and cleaner after sipping this tea. I enjoy the service of Buddha Tea's. I received my package within four days and nicely wrapped like a present. I love to open presents. Thank you Buddha Teas and keep doing a wonderful job. Thank you for the discount t coupon. I will use on my next order. The quality, aroma, and flavor of this tea is incredible. 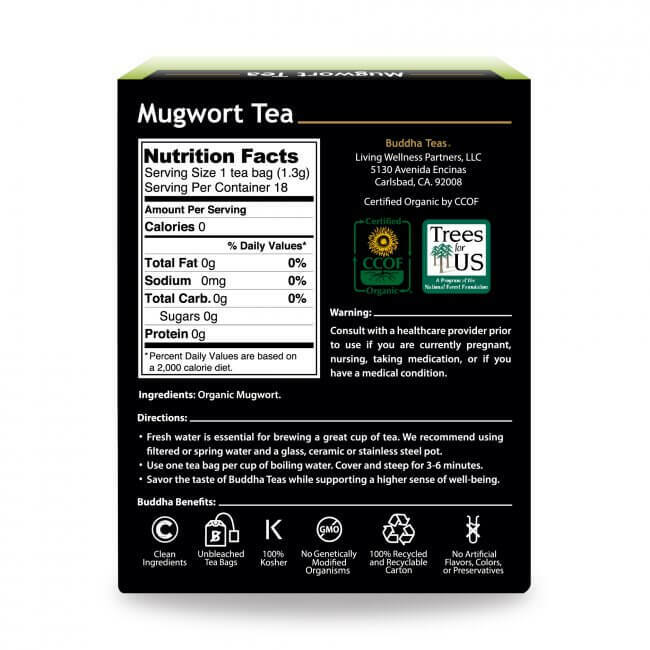 I have been drinking Mugwort Tea for a long time, and this tea compares with some of the best I have tried. These teabags are much easier to use than loose leaf mugwort tea, and you can make the tea stronger by adding an extra teabag in your cup (I generally use 2 teabags). The tea arrived before the scheduled time. Highly recommended. Yesterday I received my Buddha Teas' teas. I ordered Damiana, Holy Basil, Ashwagandha, Skullcap, and Mugwort Tea. I have had 3 teas so far and I already feel positive side affects such as pains in body have decreased, feel more calm and relaxed, digestion is better. I received the teas fast and in great condition. 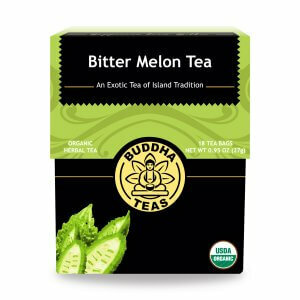 Would definitely recommend Buddha Teas to someone who has digestion problems, pains and /or stress/anxiety. There may be more effects; this is all I have experienced in one day. Order arrive quickly, quality is good. This tea is delicious. I drink it every morning as I wake up (caffeine free) and it helps with digestion! Will definitely be purchasing it from Buddha Teas again. Tea has a great flavor and it works. Love it! I WILL be getting more. I absolutely love this tea. It is the first tea I've tried that had no bitter aftertaste and needs no sweetener. I am a big fan of Buddha Tea's Mugwort Tea! I purchased it to see if it would help me remember my dreams -- and in the week that I've had a cup every evening, I've remembered dreams six of the seven nights. For someone like me who remembers dreams only sporadically, this is a impressive result! And, a few of the dreams have had that extra mystical quality that put them in an elevated class. I just ordered two more boxes of the tea, and will keep this one on my shelf as a staple.